As for video over IP, Kennedy sees the potential. The hope is to begin utilizing this technology as the network infrastructure evolves and bandwidth increases. But, he said, “We’re not there yet. The technology is still evolving and security concerns need to be addressed.” He is concentrating on switchers with HDBaseT outputs. As with many notable projects, Kennedy’s Alexa Classroom initiative began in his home office. “It is a personal project that I’ve been working on over these past 18 months at home,” he said. “I probably rewrote the codes 10 times, so it was a process.” Eventually, he got it working, and once it was operational, he presented it to the university with a request: “Can we beta test this and see what we can do with it?” The university agreed. “I’ve done alpha testing in all the buildings to present a proof of concept that I can get it working,” Kennedy added. Currently, he and the team are discussing methods for the pilot to make sure everything is transparent and above board. A key element of this stage is working out security issues with The University of Scranton’s IT department. “What we don’t want to do is initiate a pilot launch and fail,” he said. The Alexa Classroom pilot would indeed be a project too big to fail, so, Kennedy assured, “we want to make sure everybody and everything is protected in this and that it launches successfully. Our current mission is to have our pilot take place over this summer and next semester, where we have select faculty on campus actually use it.” During this critical phase, he and the team will request and analyze feedback from users. Alexa Map: Graphical representation of the Alexa Skill process. Robert Kennedy uses an animated map during his live presentations of the skill. While connected digital devices and digital assistants are rapidly growing in popularity, opinions vary on AI. How much is too much? Aren’t we already too closely tracked and monitored by Google and other Silicon Valley companies? Robert Kennedy programming Amazon Echo devices. 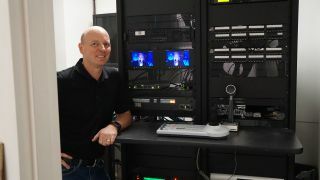 He is committed to breaking down the skill in detail so that when the Alexa piece is done, there is a module to drag into an Extron processor to link all commands. That would eliminate the need to do coding at that level. Ultimately, Kennedy is optimistic that the industry will be receptive to an innovation of this ilk for classroom AV. “I’ve been able to streamline it to where it’s a very usable skill and easily incorporated into Exton’s Global Scripter for Pro Series control systems. I’m hoping to get more institutions that are willing to help me pilot it. They can tell me what’s missing.” He also proffered another request: “One of the things I could use is, actually, an expert in Amazon’s Web Services (AWS)” for cloud computing services. Just like at The University of Scranton, for Robert Kennedy, the learning never stops. Margot Douaihy, a Scranton native, is the editor-at-large of AV Technology magazine, winner of the 2018 Jesse H. Neal Award for Best B2B Media Brand.